Throughout history, engineers have been defined as those who bring technological innovation to society. However, the concept of innovation and the role of the engineer are now changing as a result of globalization, the digital revolution, growing inequalities and environmental concerns. Training Engineers for Innovation therefore analyzes the ways in which the educational systems for engineers are adapting to these new demands, as well as the conditions in which this training has developed. 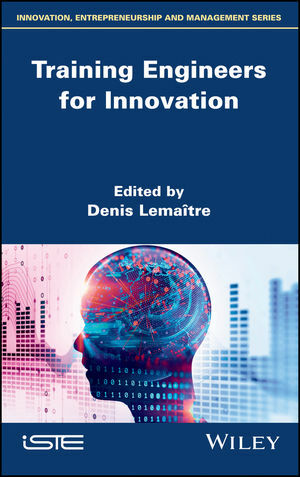 This book brings together the works of a consortium of researchers dedicated to the subject area as part of the Innov’Ing 2020 project. Its contributors present various means to devise effective pedagogies adapted to a holistic approach to innovation which incorporates the technical, economic, social, ethical and environmental dimensions of engineering. Denis Lemaître is a Professor at ENSTA Bretagne, France. 1. From Technological Innovation to “Situated” Innovation: Improving the Adaptation of Engineering Training to the Societal Challenges of the 21st Century, Emmanuel Cardona Gil, Linda Gardelle and Brad Tabas. 2. Responding to an Event: Innovation of the Contemporary Engineer?, Frédéric Huet, Hugues Choplin, Isabelle Cailleau and Pierre Steiner. 3. Innovation within Companies: Changes and Impacts on Our Student Engineer Training Models, Christiane Gillet and Klara Kövesi. 4. Skills and Competencies for Innovators: New Priorities and Requirements for Engineering Graduates, Klara Kövesi and Péter Csizmadia. 5. The Training of Innovators between Skill Acquisition and Construction of an Individual Socioprofessional Identity, Tiphaine Liu. 6. Innovation Training and Entrepreneurship in French Engineering Higher Education Institutions: An Investigation of the Commission des Titres d’Ingénieur, Anne-Marie Jolly and Julie Nolland. 7. Determinants of Skill Matching among Young Hungarian Engineers, Péter Csizmadia and Zsuzsanna Veroszta. 8. Swimming with Sharks without Being Eaten: How Engineering Students can Learn Creativity, Entrepreneurial Thinking and Innovation, Claudius Terkowsky, Tobias Haertel, Anna-Lena Rose, Liudvika Leisyte and Dominik May. 9. Engaging with Heritage to Promote Innovative Thinking in Engineering Management Education, Jane Andrews and Robin Clark. 10. How Do Graduate Engineering Schools Train for Innovation? Study of the Curricula of Three French Schools, Denis Lemaître and Christophe Morace. 11. Developing Methods and Programs for Teaching Innovation to Engineers: Toward Eco-Innovation?, Catherine Adam and Serge Coco.